At the beginning of this year I received a phone call from Radio 4 asking me if I would be willing to make prints to illustrate the 2018 Reith Lectures. Well, I hardly needed to think about it, the answer was "Yes". It sounded interesting and definitely something I wanted to be involved in. The BBC had seen the work I had produced for The Greenbelt Festival and wanted something with a similar feel. Later I found out a little more about the lectures I would be illustrating. The speaker would be historian, Professor Margaret MacMillan, talking on the subject of War and Humanity. I was asked to produce an illustration for each of the five lectures, plus one more to be used as the series image. These pictures would be used across all the Radio 4 social media platforms, their website, other promotion and invites, as well as the physical backdrop to each lecture itself. Amazingly, MacMillan planned to talk with just a few notes, so there was no transcript for me to work from to ascertain the details of each talk. I was given a loose idea of the subject of each lecture and with guidance from the producers and media team worked through lots of ideas to arrive at the final six designs. I made each print using the reduction relief printing process. This essentially means that instead of having a separate printing block for each colour, just one is used by cutting away each layer of colour in between prints until all the layers have been printed on top of each other - this means that the printing block gets cut away to nothing and can't be used again, there is no going back to make changes once all the cutting has been done. I knew that these illustrations would all be shown either digitally on a screen or as commercially printed media, so the original prints themselves would not be the finished work - a new thing for me. After I had completed the first 'Series' image as multiple 2-3 colour reduction prints, it was decided that the colours weren't right. As I mentioned before, completed prints can not be altered once the layers have been cut away. Fortunately I'd had the foresight to print each colour separately as well as a completed print and so these separations were each scanned and the colour altered digitally and compiled again just like when a traditional print is made, layer on layer. I made the decision from this point on that for the remaining five images that I would print each one in the same colour separation way, but still use the reduction print technique so that I could be sure that the registration [lining up] of all the layers would be accurate. I printed each layer in black ink as this would be best colour to scan. Some of the lecture images had as many as 7 layers. The prints themselves were relatively large to make sure enough detail could accurately be cut into the image as I knew they would be blown up to cinema screen size. This makes for a lot of cutting! It might seem strange to go through this whole time-consuming printing process when actually the final image is compiled on a computer, but the style of illustration the commissioners had seen of mine and wanted to use in their own work was a 'printy' style. There is a particular quality to relief prints that I love - the lively little marks that are part of the image, showing the artist's hand in the carving of the block and the only way for me to do this authentically was to actually make the prints the old fashioned way! 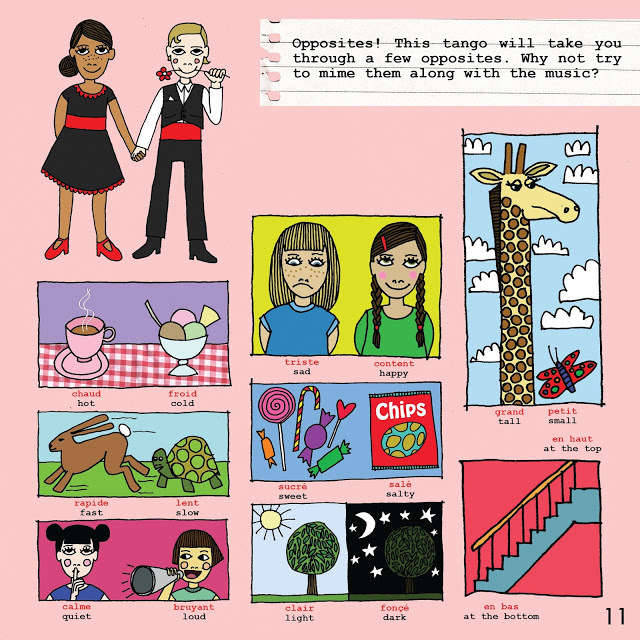 I worked alongside graphic designer, Wilf Whitty, at Ratiotype who helped me by scanning and digitally layering all the finished images, while I cut and printed late into night in order to get the work completed in time for the BBC's deadline. The lectures take place in London, York, Beirut, Belfast and Ottawa and are broadcast in June and July 2018 on BBC Radio 4 - you can listen again via their website, where you will also find all my illustrations. This lovely magazine article by Meryl Doney in Reform magazine this month features my Gentle Revolution print and a write up about the exhibition I was involved in last year. To celebrate the launch of my new website I am offering 20% of everything in my on-line shop, just use the code RUBYTUESDAY at the checkout. click on the 'shop' link. Last year I was invited to be involved in World Turned Upside Down, an exhibition in Leeds curated by illustrator Si Smith with support from Leeds Inspired. Artists and poets were asked to make work in response to the Beatitudes – the 8 statements from the Sermon on the Mount. Initially I found it hard to see how these words relate to us at this time. They are words that invert our power structures. The opposite of the power-hungry, greedy and ruthless values we often see in the people that run our countries, who don’t seem to consider the meek and those without a voice; the poor, the very young, the sick and the elderly – the most vulnerable in society. This is particularly marked at a time of fallout from Brexit, which seemed to bring out an openness in racial hatred and the USA voting for a person as self-serving and prejudiced as Donald Trump to become their leader – both are shocking and depressing. The idea of meekness, or gentleness, being of greater value than power, status and riches is alien in our society, but at the same time I can’t help thinking people need to know the bullies don’t have to always win. I’ve never considered myself a particularly political person and am naturally quite shy, but last year I felt compelled to join marches and rallies to support change. I am supporting a gentle revolution with kindness at its centre. A rise in gentleness, thoughtfulness and compassion for our fellow humans. It is important not to confuse gentleness with passiveness or apathy, it is just a different way to communicate – meekness can be very powerful. Making this piece of work has made me mindful of the fact that we don’t always have to make big showy gestures to make a difference. The small act I can make each day to show an individual some kindness is equally as powerful and important. I have never made a piece of work that has received responses like this print. I have been encouraged by the passionate and inspiring conversations it has provoked in people of all ages. Some people felt compelled to buy the print to share these values with their family every day. Other people may not have found the print to their aesthetic taste, but have told me that it made them cry. When I hear things like this it makes me feel quite emotional, I think this is due to a feeling of solidarity, the idea that my values resonate with someone else. That maybe we really are having a gentle revolution. You can buy one of these limited edition 'Gentle Revolution' lino prints from myonline shop. 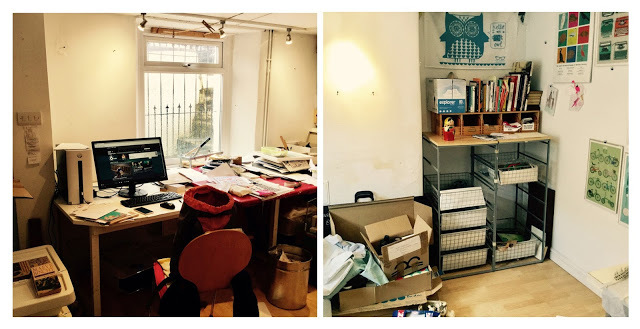 I have blogged before about the process of a cathartic declutter in my studio and lately I had been feeling like something similar was brewing. My studio was the visual representation of how my head has been feeling recently – messy and chaotic. I am in the hugely fortunate position to use a room in the shared studio of my parent's house; both creatives, they set up the basement studio space when they moved in 14 years ago. Recently, the scale of my prints and the different areas and way I work has changed. I felt like my studio and I had grown apart – I wasn’t working efficiently or effectively. It was time for a change, time to find a new studio. I admit to feeling a little anxious about not wanting to seem ungrateful when talking to my Folks about the change, but they were brilliant and rather than moving studio they were willing for me to update my part of the studio space in order for it to work better for me and the way I work now. The first change I needed to make was to get a plan chest to store large prints away – giving me more table top space, but also making it easier to keep the prints organised, clean and safe [these were previously taking up a large amount of space on my worktop, being shunted about from surface to surface in order to work around them]. I looked for second-hand chests and couldn’t find anything that would work in my space, so I decided to build one into an alcove. My husband helped me to construct a framework for drawers to slot into – this was tricky as the alcove walls were far from square or straight! I then set about constructing drawers and shelves. I purchased new storage crates that would fit into the shelf unit we had created. I have to say I am delighted with results. My second issue was work space and a lack of permanent storage, rather than items stored in plastic boxes, then stowed under my desk. I acquired upright shelf units and storage boxes which took up less floor space. The desktop that I had been using was brilliantly ‘multi-use’; office space/printing bench/jewellery making station/mounting and framing surface, I felt it was time to compartmentalise these different areas of my work so I removed the large built-in desk and created a separate office. I purchased two extendable tables so that I could have as much or as little work surface depending on the requirements of my current project, but also meaning I can have two separate projects on the go [as is often the way]. Lastly, I made the decision to include an armchair into my new work environment – not as you might think for tea breaks [though this is a bonus], but actually a fair amount of my work I make on my knee in the comfort of my sofa at home in the evenings and it struck me that this simple addition to my studio might help me alter my perspective on saving the less 'heavy-weight' work for my ‘down time’ and treat it as equally significant to the running of my business as other areas of my work. Embracing the work that encourages me to nestle down rather than only valuing the work that means I'm hurtling around feeling like I'm 'getting things done'. Now that the chair is in and the desk has been taken out from below the window I can now sit in good daylight to work on stitching, making and writing. I love it! Colour CODED, a group exhibition at the Devon Guild of Craftsmen, 29th Jan - 29th Feb 2016. Devon Guild Members, Ruth Broadway, Stuart Low and Angie Parker, are three distinctive makers working in print, glass and weave. In Colour Coded, each maker has drawn upon skill sharing sessions and group discussion to explore personal responses to the themes of colour and shape. 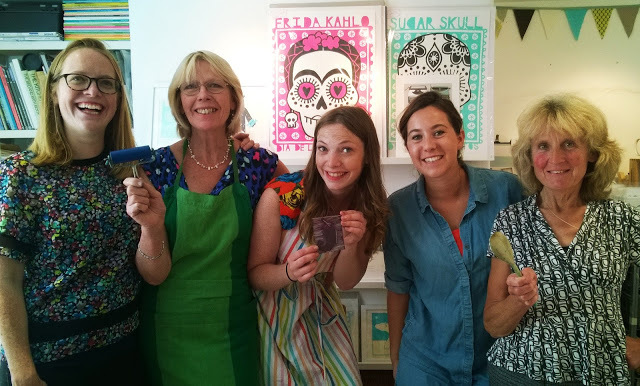 A few weeks ago these lovely ladies came to learn lino printing in my studio. 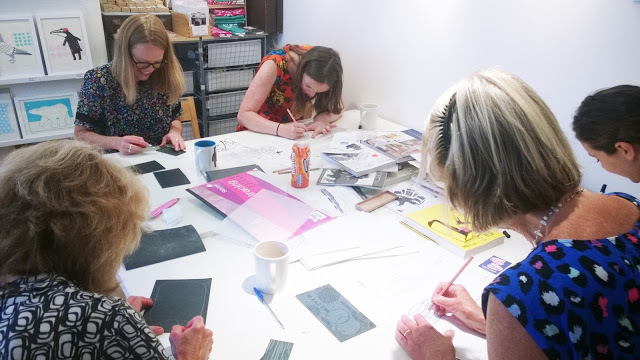 The idea was put to me by Ruth [on the left] that I might run a lino printing workshop as a birthday gift for her mum Louise [2nd left] as a fun and sociable and creative celebration for various friends and family. They booked a 4 hour workshop, giving plenty of time to develop designs and ideas. They started by finding inspiration from books, magazines and each other. They were all so encouraging of each other and enthusiastic to learn, it was a pleasure to spend the day with them. Once the designs were finalised then the fun of carving the lino could begin. Some people chose to concentrate on one challenging and detailed design while others produced multiple smaller lino blocks. After a short lunch break it was time for the messy part of the process to begin! Mixing colours and rolling out and applying the ink to the printing block. Everyone learnt how to burnish by hand with a wooden spoon to rub the ink from the block onto the paper. There was also the opportunity to use the table top printing press in my studio, but I was interested to see that most people seemed to prefer to burnish by hand, as I do myself. For me the best bit is gently pealing back the paper to reveal your print. It would have been hard not to get swept up in the group's excitment and enthusiasm for each others work as each new piece was completed. At the end of the day the drying line had some really beautiful work hanging on it. If you are interested in booking a group lino work shop for a gift like Ruth did please get in touch. My studio is not huge so numbers are limited! This has been a lovely project to work on, and I am very excited to see it completed and finally get to hold a copy in my hands! 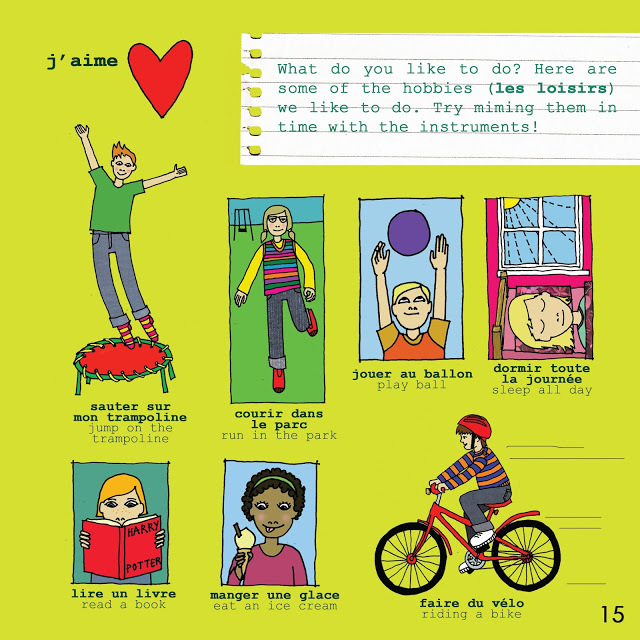 I was commissioned to illustrate this book to accompany a CD of original french songs by Les Petits Zouzous a local french school for pre-schoolers and up. My daughter has been listening to the music with the book on her lap over and over since it's arrived in our house! My printed illustrations have been used for the branding for the Greenbelt Festival this year on the theme of Acts of the Imagination. 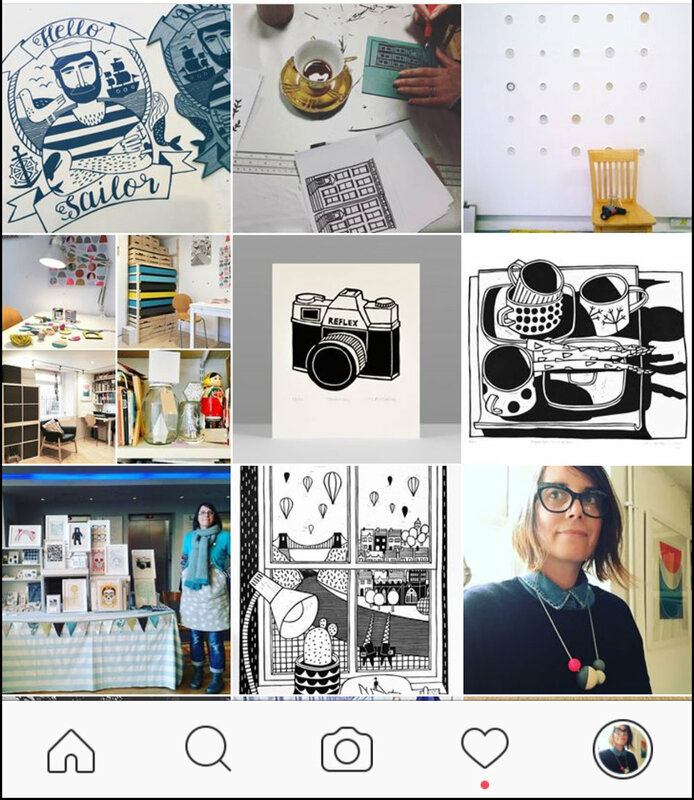 I am their guest blogger today too - their website is looking rather lovely and includes a little animated song using my prints!